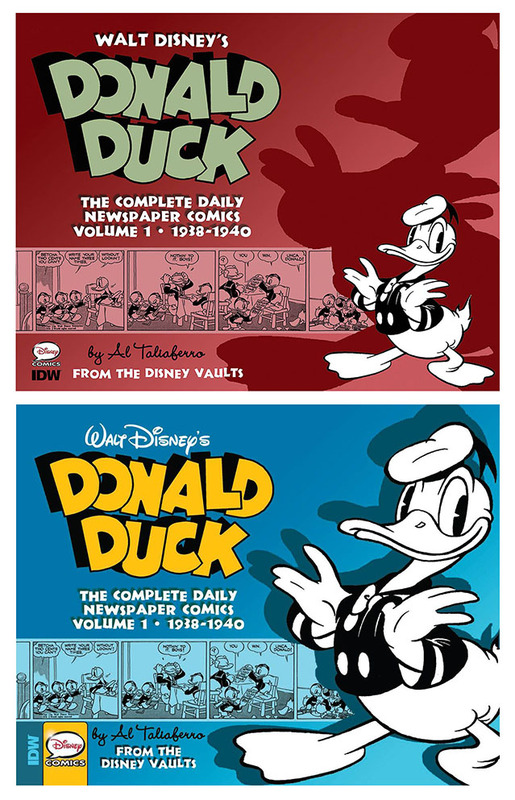 The first volume of Donald Duck: The Complete Daily Newspaper Comics came out last month. 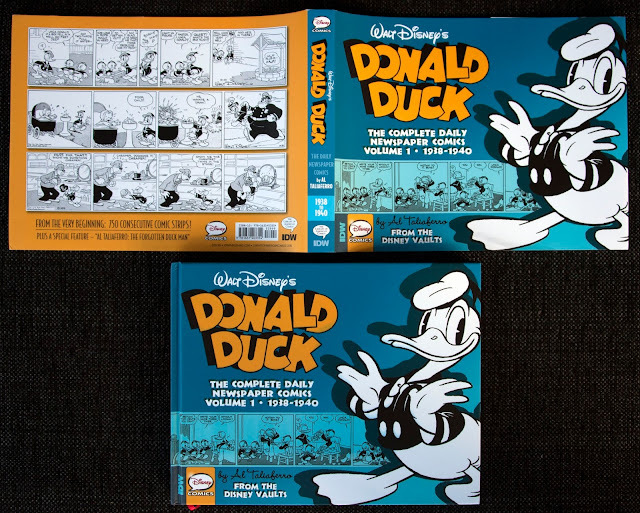 For the first time in English, the book is chronologically collecting the daily newspaper strips with Donald Duck. The first volume collects all strip from the beginning February 7, 1938 to July 20, 1940, roughly two and a half years with a total of 768 strips (if I counted right). The book is published by IDW as part of their Library of American Comics. I haven’t seen any info about this book being collected in future box sets like Fantagraphics like to do; instead it comes with a dust jacket. This is an important piece of Disney comic history, which I think should have been published in a collection like this a long time ago. But initially I was personally not too excited about this book, mainly because I already have all of the strips inside collected in Norwegian books. And also because there are so many other publications coming out these days. With monthly Disney comics from IDW, and three different series of hardcover books from Fantagraphics there’s a bit too much on the market right now. Another reason is that I tend to get bored fast when reading collections of gag strips, I prefer the longer adventure stories, and wasn’t too excited about re-reading the early Duck strips. But I decided to give the first volume a try and pre-ordered it this summer. The pre-release cover art was slightly different at the time I ordered the book. Not that much was changed in the final layout, but I like new blue one better. While waiting for the book to arrive in the mail I managed to hype myself up so much that I did a cover-to-cover read the same day it arrived! 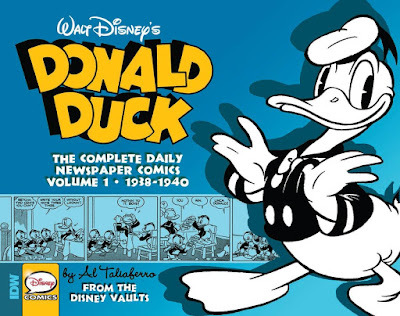 (and a lot of it again while writing this blogpost) I did this by reading other Taliaferro comics and articles and re-watching the early Donald Duck animated shorts that I knew shared a lot of similar gags and ideas. But at the same time refraining from reading the strips collected in this book. So I went from a bit reluctant to really excited while waiting for the book. All strips in this book are drawn by Al Taliaferro and the book starts with the first part of an essay about him. The introduction tells us that Taliaferro have never gotten the fame he deserved like other Duck artists, but then goes on saying that Al Taliaferro is one of an elite group known as the "Duck Men" (a bit contradicting isn’t it?) Later in the article we can read that the other three members of this group are Barks, Rosa and Jippes. Really? Who defined those four as the Duck Men? That labeling is really stupid if you ask me. Yes, Carl Barks is commonly referred to as "the duck man" and sure Rosa and Jippes have a large fan base. But so does van Horn and others. If someone had randomly said "duck men" to me, one of the first persons I’d think of is Jack Hannah (and yes, Taliaferro and Barks too). So far IDW has done a great job with its monthly titles, printing lots of Italian material. Especially by Romano Scarpa that I think should get more attention, and with that showing the American readers that great Duck comics is a lot more than Barks and Rosa. So why suddenly try to label Taliaferro, Barks, Rosa and Jippes as the elite "Duck Men"? The intention is probably to give Taliaferro more fame, but now you give the casual reader the impression that those four are the best of the best. And that is highly subjective. Ok, the little rant is over. 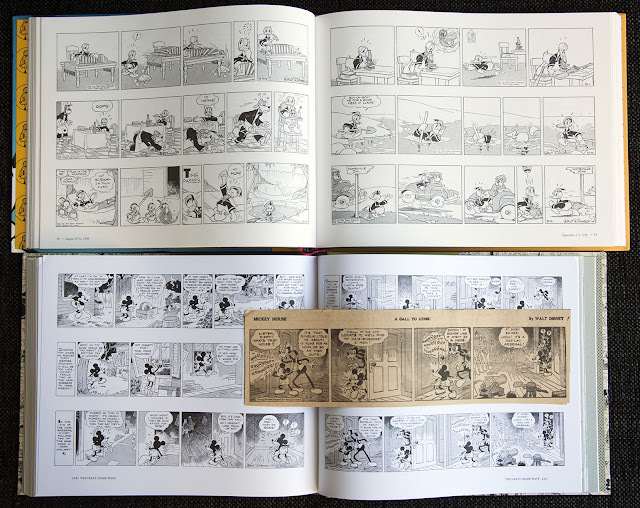 When I started reading the comic strips I got the impression they were printed in a larger format than the Floyd Gottfredson Library does with the Mickey Mouse strips. But when comparing the two books I found out that’s not the case at all. They both print the strips in about the same size. While I think this size works perfectly for the Donald Duck strips, I wish the early Mickey-strips could have been printed a bit larger. They are often very detailed with a lot of dialog and action going on in every panel. Im not sure if the strips have undergone any major restoration work (I don't think so) but the source material seems to be good. According to the credits, the source for some of them are the "Billy Ireland Cartoon Library & Museum", so it sounds like they try to track down the best possible source. The early newspaper strips are made so they can be printed in both one or in two rows, where the first and second part of the strip are the same size. The Norwegian collection prints the strip over two rows, but I think it’s better to have the entire gag in one row like we have in the IDW book. Also, I think that's the most common way they were printed in the newspapers. The first 3 books in the Norwegian collection, collecting the same strips as the first IDW volume. Donald visit Gus’s farm from November 9 to November 19, 1938, continued with 5 days of Donald back home with the goat. Seen in the Mickey Mouse newspaper strips and in Mickey’s Elephant (1936). Indented to be used in more animations that never made it to the screen. This story might be adapted/inspired by one of those drafts. An interesting thing to note is that all these mini-stories start on a Monday and the majority of them go on for exactly two weeks. And a few exactly one or three weeks. So they were probably planned out to be a serial of a specific length from the beginning. Lemonade, woodpecker and a hammock, inspired by Self Control (1938). We can see the woodpecker bugging Donald in a lot of other the strips in this book too. From June 9, 1938 and the animated short "Self Control"
Donald’s polar expedition from August 15 to August 27, 1938 are based on Polar trappers (1938). We can see the same sign in the beginning. 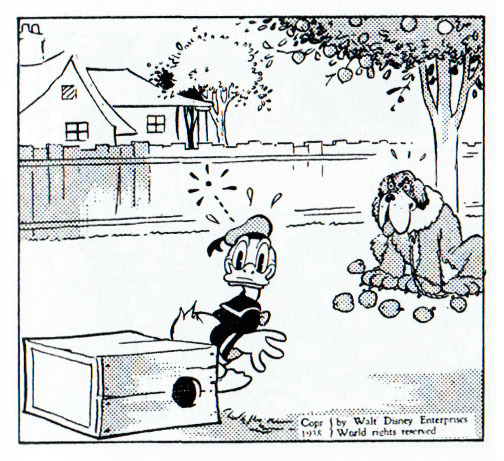 From August 15, 1938 and the animated short "Polar trappers"
And Donald in a tuxedo disguise. A similar name was later used in the 1939 animation Donald’s Penguin where the penguin is called Tootsie. From August 18, 1938 and the animated short "Polar trappers"
We first see a short serial with Hortense from October 3, 1938 to October 15, 1938, but he re-appears in several newspaper strips later. Under is Donald receiving a mysterious package in the newspaper strips and the 1937 animation Donald's Ostrich. From May 9, 1938 to May 24, 1938 we have a serial about Gus visiting Donald. 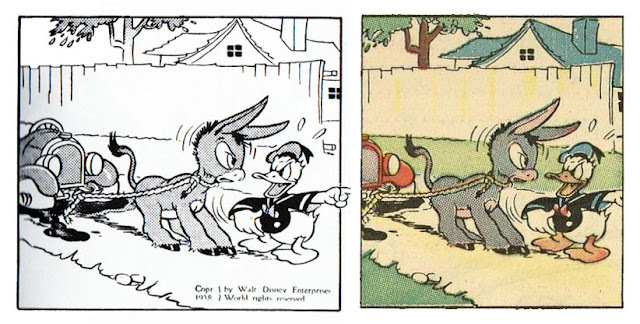 The first two strips tell the same story as the start of the 1939 animation Donald's Cousin Gus. First we have Donald receiving a letter from Aunt Fanny. Then *pooof* Gus gets right to the dinner table and starts eating. The rest of the story is different in the daily strip and the animation. As the animated short came out a year later, the daily strip can’t be adapted from the finished version. Maybe it’s the other way, or maybe they both got the idea about Gus appearing on Donald’s door from an early script? It would be interesting to know the origin of that first part of the story. What we do know is that Gus was originally intended for another animation Interior Decorators, that was never finished. 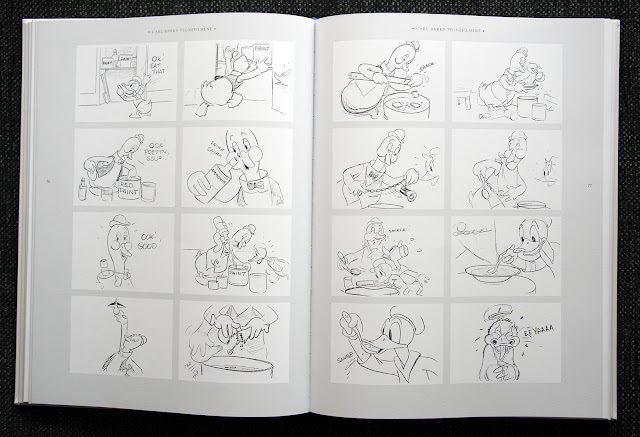 Some of the storyboards are printed in the Norwegian book Carl Barks – Tegnefilmene, part of a series of extra books for Egmont’s Carl Barks Collection. Sketches for the unfinished animation "Interior Decorators"
The sequence where Gus appears on Donald’s doorstep does not seem to be a part of that story, but we do have a gag showing Gus' huge appetite. 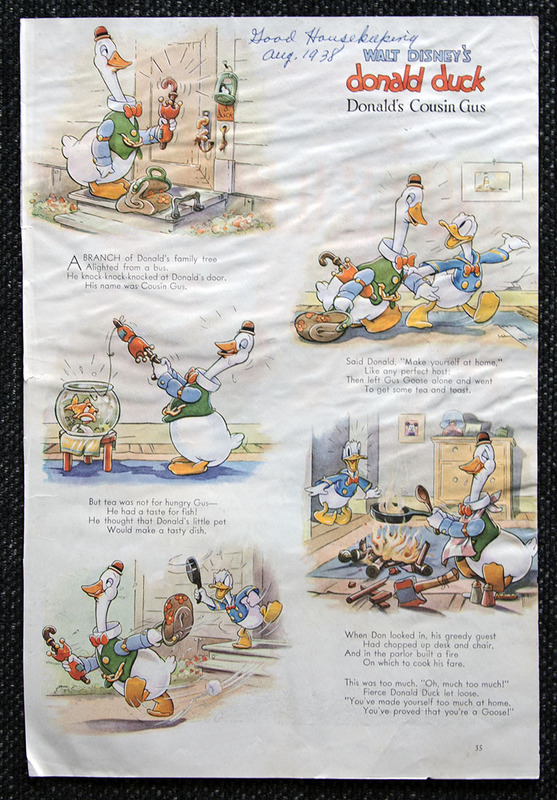 The August 1938 issue of Good Houskeeping also had an illustrated rhyming story with the same opening, but otherwise different story. It’s printed after the daily strip, but before the animation. Another interesting thing in this book is to follow the introduction 313, Donald’s now famous car. It all started February 24, 1938 when he gets rid of his old car. Notice that the license plate on the old car says 113. The first time we get to see 313 is in the July 1, 1938 strip. 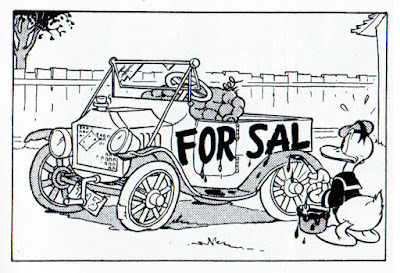 The car does not have a license plate in this strip, and as the newspaper strips are in black and white, we don’t get to know the color in this first comic appearance. 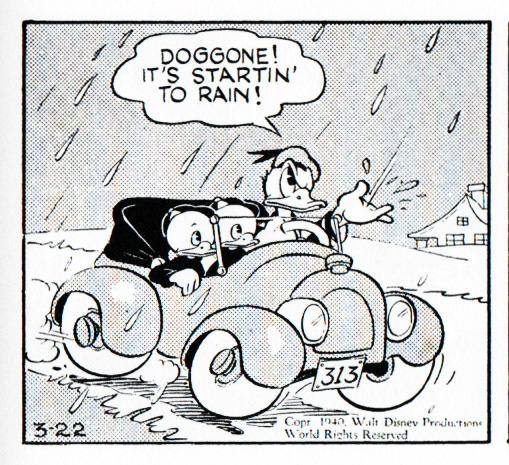 The car design and the later red coloring in the Dell comics are probably both from the 1937 animation Don Donald. We usually see the whole car in this same gray shading, but one time the fenders were colored all black. This looks more like the Italian way to color the car where the fenders are blue. Then on March 22, 1940 we finally see the 313 number. This is the first time we see this number as far as I know, so the number is probably invented by Bob Karp or Al Taliaferro. The next time we see Donald use another car after this, there’s a hidden number joke. 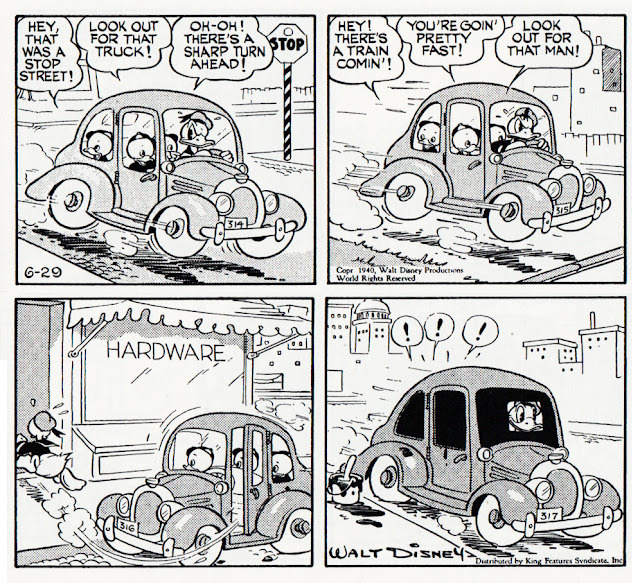 Look closely at the license numbers in the June 29, 1940 strip. When Western started making Disney comics they continued using the same car, and the good ol’ 313 is now synonym with Donald’s car. 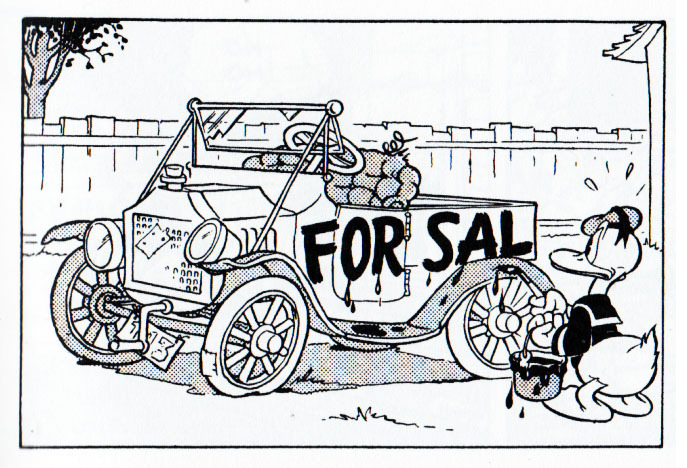 Carl Barks using the car in "Good Neighbors" and "Volcano Valley"
The Silly Symphony Sunday pages started the whole Donald Duck universe and Mickey Mouse universe thing. Earlier they had been appearing together in the Mickey Mouse newspaper comics. But to not have the same characters in two different Sunday series at the same time, Donald stopped appearing in Mickey stories when he got his own Silly Symphony series in 1936. 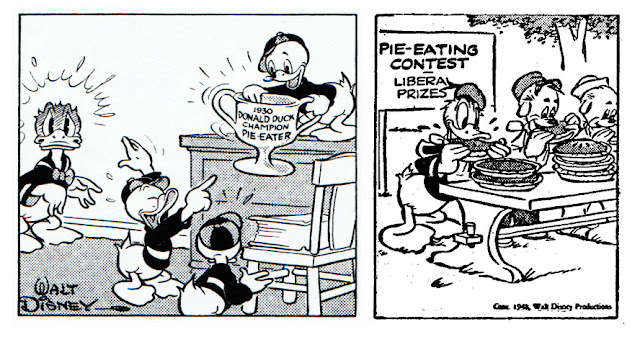 This continued in the Donald Duck daily strips making the Mickey and Donald comics appear as two different universes. But one little slip-up seems to have been made. 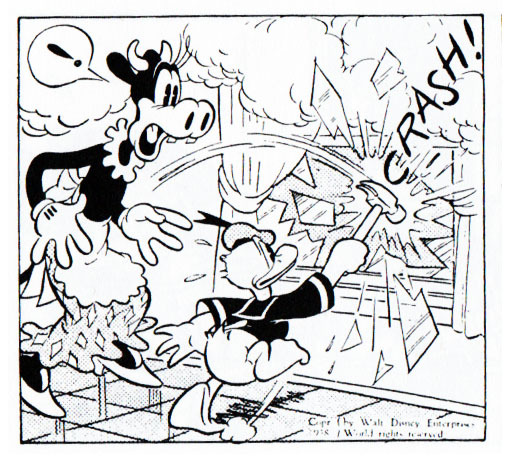 The February 28, 1938 strip features Clarabelle, an at the time regular character in the Mickey-strips. We get to know that Donald won the pie-eating contest in 1930. But did you know he won it again in 1948? 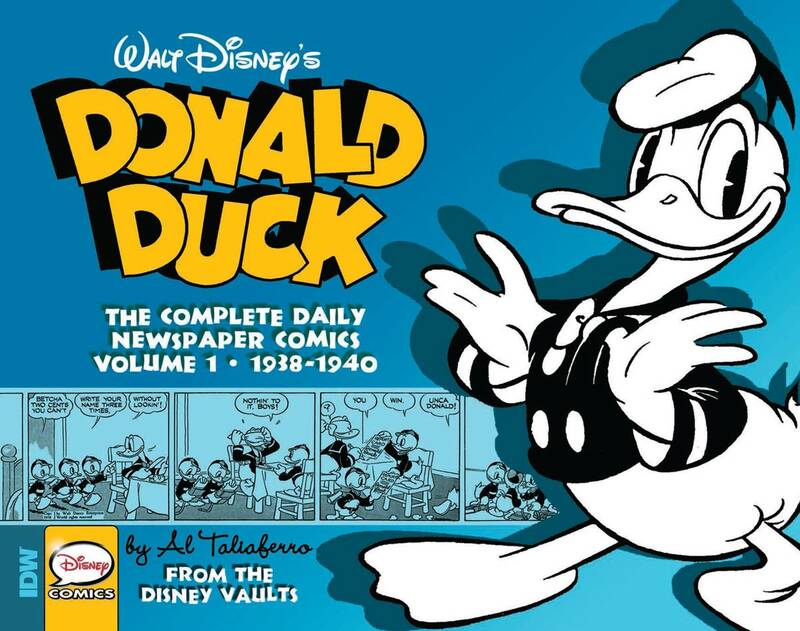 About the same time as vol.1 of the "Donald Duck: The Complete Daily Newspaper Comics" was released, vol.2 and another book were announced. The new series will be called "Donald Duck: The Complete Sunday Comics" starting with Donald’s Sunday pages from 1939-1942. Bruce Canwell said in an earlier interview that they planned on doing a Silly Symphonies series, so I half-expected that to come first. But I’m not surprised they decided to do the Donald Duck Sundays first to see how they sell. I hope they still plan on doing the Silly Symphonies collections though; personally I’m a lot more excited for those! I really want to see Elmer Elephant and some of the other rare series collected! The release dates can still be changed, but Amazon list January 14, 2016 for vol 2 of the daily strips and March 3, 2016 for the Sunday pages. To summarize; I had a lot of fun with volume 1 of this series, even if it’s just a collection of simple gag stories! Maybe one of the reasons was that the book didn’t have any articles with background info or trivia like we are spoiled with in the Floyd Gottfredson books. So I had to do all that research myself. But I’m so lucky I have a large collection of comics and articles to dig into. For a more casual reader of the book, I see a lot of wasted potential for interesting background articles! F.ex. about Gus Goose, comparison to the animated shorts, or about 313 as I wrote about in this blog. But an article about Bobo the elephant, similar to the one in the Floyd Gottfredson library vol.3 would have been nice too. Or just a simple gallery with covers inspired by the strips in this book. I’m definitively going to get the next volume too, but I hope we get to see more bonus material in future books. I’m pretty sure I read a preview of the essay in this book that had some text about different layouts for the strip. 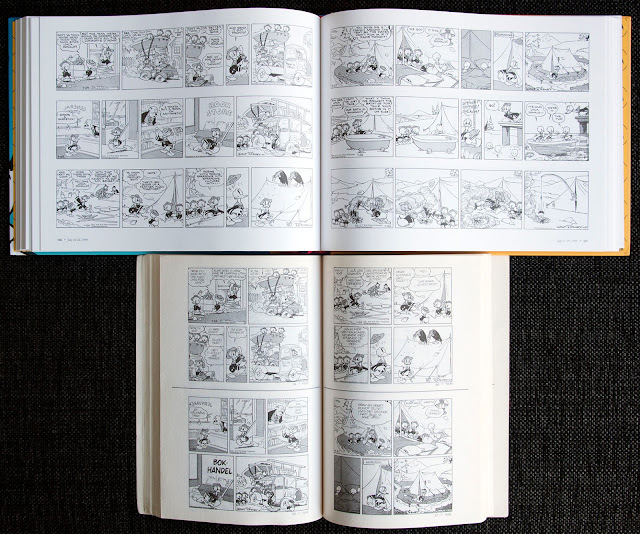 During a period the strip was drawn a bit larger, but prepared in two versions where the most common version has the bottom part cut away. Maybe this text was cut out of the final draft, or maybe it’s in the second part of the essay (in the next book). Or maybe I read about this somewhere else...? Anyways, anyone know what period of time the strip was prepared in two different sizes? I’d like to do some research into this. Information about the first of four Silly Symphonies books got added to Amazon soon after I wrote the text in this blog. The first one is planned to be releasesd March 17, 2016 (can be changed) so we have a lot to look forward to next year. 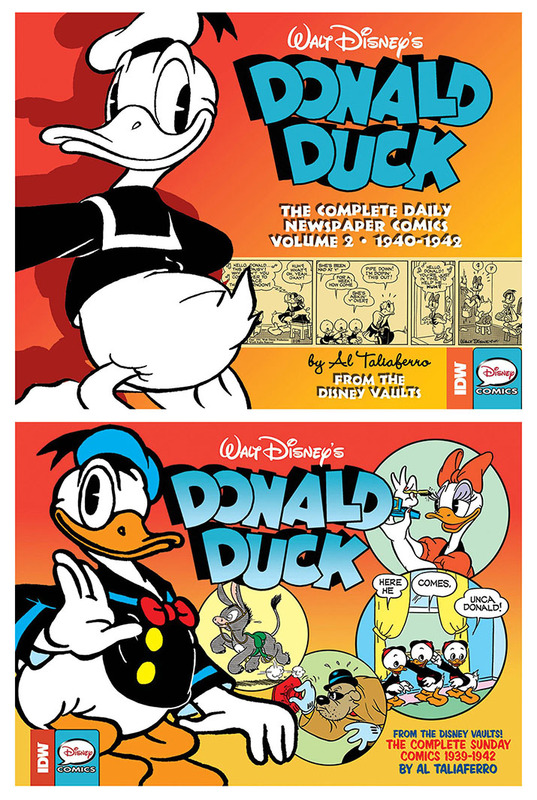 So far only four books have been published in the Donald Duck daily strip series (up to 1947), and two books in the Sunday page series (up to 1945). The daily strip books each cover 1.5 years and the Sunday page books cover 3 years each. So by my calculation the 1969 daily strip will be in volume 13 and the 1964 to 1968 Sunday pages in volume 9 and 10.